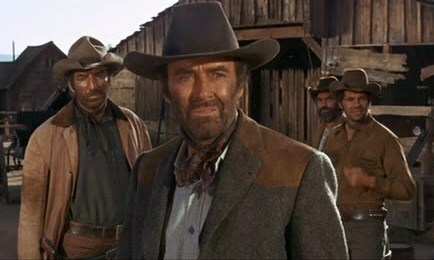 FIRECREEK is just a 1968 footnote in the long and distinguished careers of James Stewart and his close pal Henry Fonda. Competently handled but as inconsequential as a made-for-TV effort, it’s another in the depressing cycle of ‘meek town vs. ruthless gang’ plots that had the double-edged effect of life-supporting the ailing Western genre while letting another 104 minutes of steam wheeze out of it. How come I get wounded in every friggin’ western I’m in? Vincent McEveety was primarily a television director, and the title town has that under-populated look common to that medium. ‘Firecreek’ is a town full of losers, nominally as undeserving of rescue as the thankless folks of High Noon, Warlock or Welcome to Hard Times. 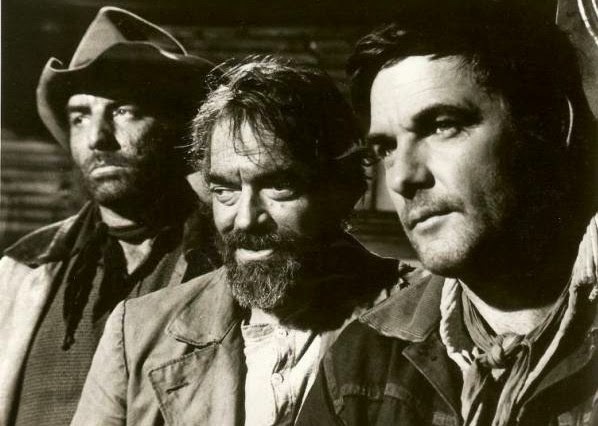 Stewart is the lone good guy:a fair mite past spry at 60, but still game enough to deliver a fiery “because I say so!” speech, after enough humiliation has been dished out by Fonda (in like fetter on the meanie side) and his louts–Gary Lockwood, Jack Elam, James Best and Morgan Woodward. After a decade of TV toiling, Lockwood may have felt he was on to something, since this credit with two greats came the same year as his co-starring in 2001:A Space Odyssey, but neither break broke the small-screen tether. Trying to convince her he will soon be in outer space. Inger Stevens gets yet another humorless role, 4 for 4 in joy-free westerns. Barbara Luna gets to be exotic & threatened once more: this time the Filipino beauty is a ‘squaw’ instead of a Polynesian, Mexican, Arab or Star Trek space vixen. Also on hand to cower are Dean Jagger, Ed Begley, Jay C.Flippen, and John Qualen. To balance all those old men, the script angles in pretty Brooke Bundy, looking like every 60s starlet in a period piece from that era—Barbara Hershey, Margaret Blye, etc.—about as western as Westwood. Good color lensing from William Clothier, muted scoring from Alfred Newman. The film was largely ignored, its take coming#79 for the year. Stewart fared better that summer with Bandolero (#18), and Fonda topped that at #11 with Yours,Mine and Ours, in a quite-busy year for him that also featured Madigan, The Boston Strangler and— most memorably as another bad (really bad) guy— Once Upon A Time in The West.